I had recently commented that while I enjoyed tracking and cataloguing new issues, what I really liked about hosting this site was finding out about previously uncatalogued issues. Matt Crance posted on ht Camp Babcock Hovey Facebook site a discovery of an uncatalogued Ganeodiyo Lodge #417 patch issued for participating in a project for their OA Stage Project in 2005-2006. This week we go back to 2005. That was the year that work began on the most recent version of the OA Stage. The wooden structure was complete by the end of 2005 but would not receive a metal roof until 2006. There are currently no know pictures from the build of the stage, and would be greatly appreciated. 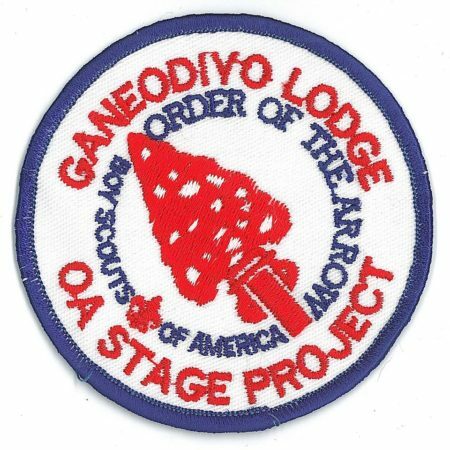 We are featuring a never before seen patch that was issued by Ganeodiyo Lodge to helpers that helped build the stage. This is an extremely rare patch from Ganeodiyo Lodge. Thanks to all that helped make the OA Stage happen as it will be enjoyed by many years of campers. « State of the Hobby – Wakpominee Lodge #48 Whatsit?